One hundred years ago on September 1, 1914, in the Cincinnati Zoological Garden, the last known passenger pigeon (Ectopistes migratorius) died. Her name was Martha. 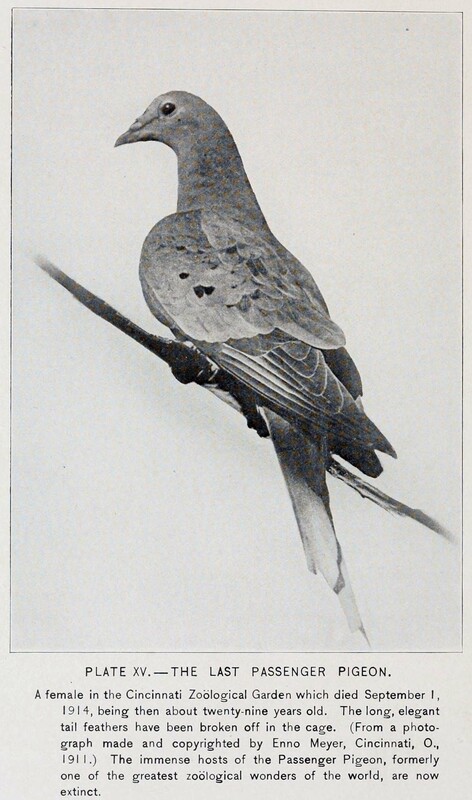 Martha, the Last Passenger Pigeon (Adapted from Forbush 1916). The skies of North America once teemed with these creatures, but by the end of the 19th century, their numbers were decimated by the twin perils of over-hunting and habitat destruction. The birds must have been striking as the darkened the sky in the thousands and tens of thousands, particularly the more colorful males. 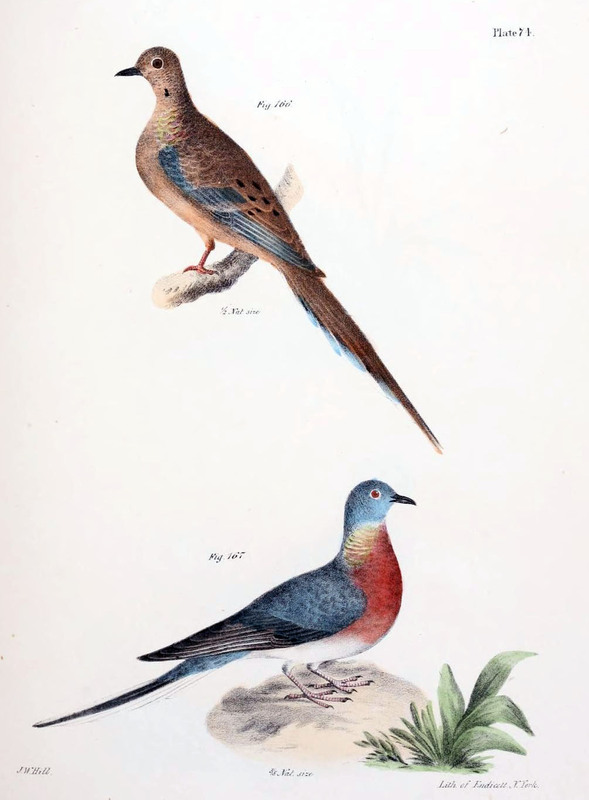 Female (top) and male (bottom) passenger pigeons (Adapted from De Kay 1842). We can expect the remains of passenger pigeons to be present in historic and pre-Contact archaeological assemblages, but they may not be readily identified as such since zooarchaeological type collections are often built from examples of recently deceased animals–not long extinct species. Knowing that this is an issue, the Virtual Curation Laboratory (VCL) began to scan skeletal elements from passenger pigeons shortly after the VCL was established in August 2011 to comply with the requirements of a Defense Department (DoD) Legacy Program funded-project (#11-334) “Virtual Artifact Curation: Three-Dimensional Digital Data Collection for Artifact Analysis and Interpretation” (Means 2014; Means et al. 2013a, 2013b). The basic goal of this project was to test the suitability of the NextEngine Desktop 3D scanner on as wide a range of archaeological materials as possible, including animal remains recovered from archaeological contexts or present in zooarchaeological type collections. 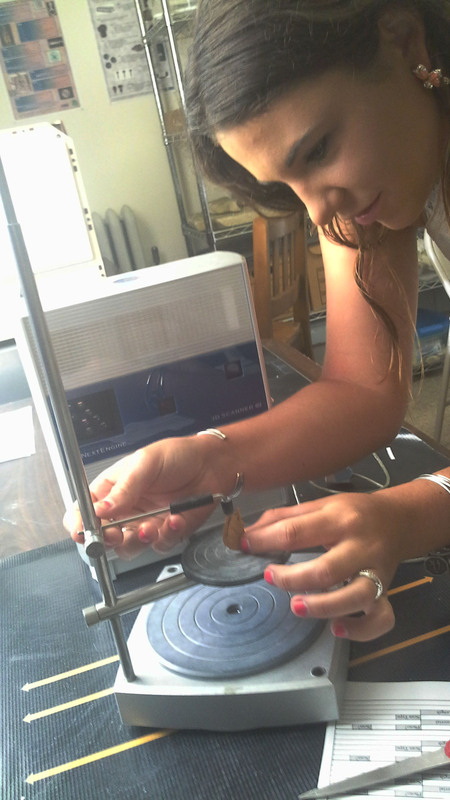 VCL’s First Digital Zooarchaeologist Marianna Zechini prepares to 3D scan a raccoon femur. 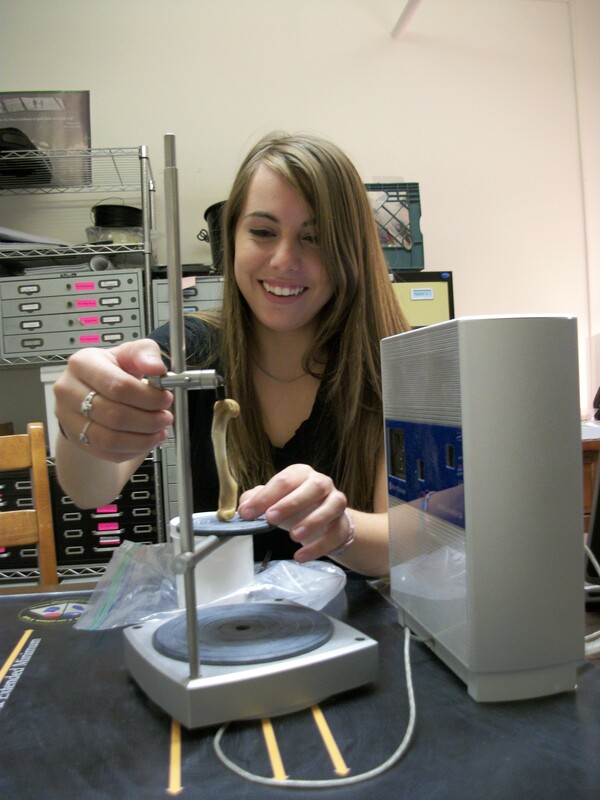 Then Virginia Commonwealth University (VCU) student Marianna Zechini–now a graduate student at the University of West Florida–led these efforts to scan the passenger pigeon bones as part of her dedicated undergraduate research (Zechini 2014a, 2014b, 2014c). The post-cranial elements were obtained from archaeological contexts held in trust by the Virginia Museum of Natural History (VMNH) and VMNH’s Curator of Archaeology, Dr. Elizabeth Moore, was instrumental in selecting these bones. Passenger pigeon humerus from the VMNH. The digital morphological models can be readily shared with researchers across the globe, who can use freely available software to examine the skeletal models from every perspective—something not possible with static photographs or illustrations. These digital bone models can also be accurately measured, enabling detailed comparisons between the digital type element and the element being studied by a researcher. 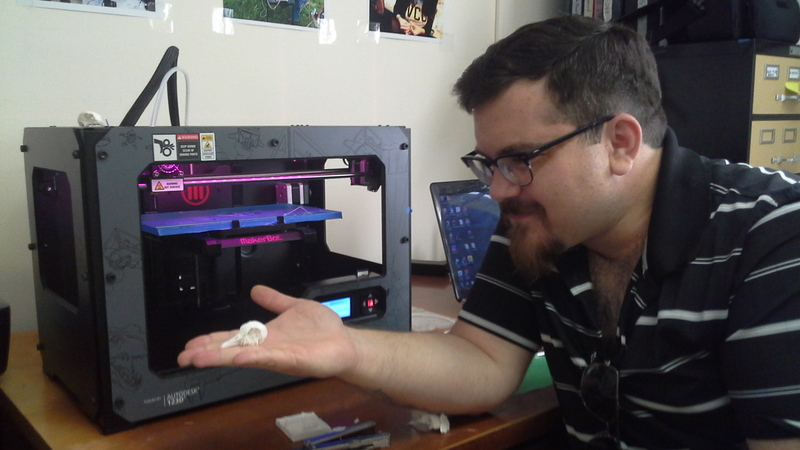 VCL Technology Supervisor John Bush holds a 3D printed passenger pigeon skull. 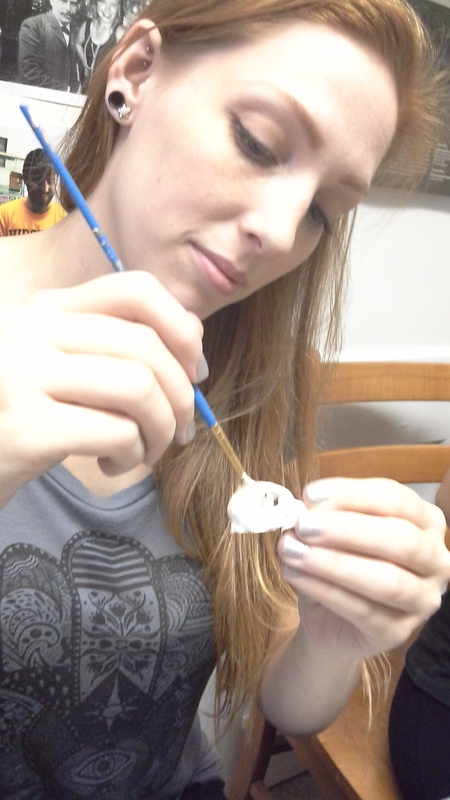 VCL’s New Digital Zooarchaeologist Rebecca Bowman paints a printed passenger pigeon skull. The digital bone models can also be readily printed, either with a home-based desktop 3D printer or sent to a variety of commercial 3D printer bureaus, who can print not only in plastic, but also in a variety of other materials, including metal, ceramic, and even chocolate. Recently, the VCL began a new DoD Legacy Program funded project in October 2013 entitled ““Virtual Mobility Archaeology Project with Further Applications of Three Dimensional Digital Scanning of Archaeological Objects.” The new project is targeted toward the creation of digital type collections to ensure speedy and accurate identification of materials recovered from archaeological sites on DoD (and other) lands, specifically one digital type collection of temporally diagnostic chipped stone tools and another of animal remains. VMNH’s Dr. Elizabeth Moore also aided with the selection of materials for this digital faunal collection, and the majority of skeletal material 3D scanned as part of the new DoD Legacy project are from VMNH’s physical type collection or from archaeologically recovered bone currently being studied at VMNH. However, because the VMNH did not have a passenger pigeon cranium, the VCL contacted Brian Schmidt in the Division of Birds at the Smithsonian’s National Museum of Natural History (NMNH) and he made two craniums and other elements available for study. Passenger pigeon skull scanned from collections at NMNH. With the assistance of Tom Woodward of VCU’s ALT (Academic Learning Transformation) Lab, we are pleased to announce today also the Beta version of an App that enables the user to view and manipulate select skeletal elements from the passenger pigeon scanned from the collections of VMNH and NMNH: http://augmenting.me/passenger_pigeon/. 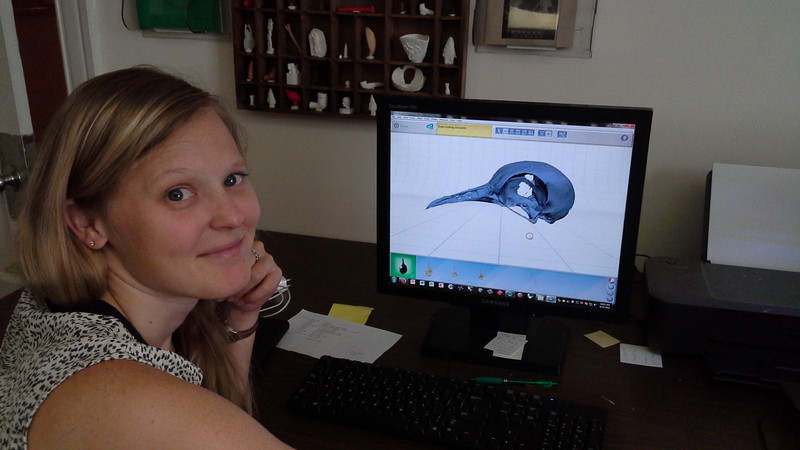 VCL Digital Curation Supervisor Lauren Volkers edits the digital model of a passenger pigeon skull. 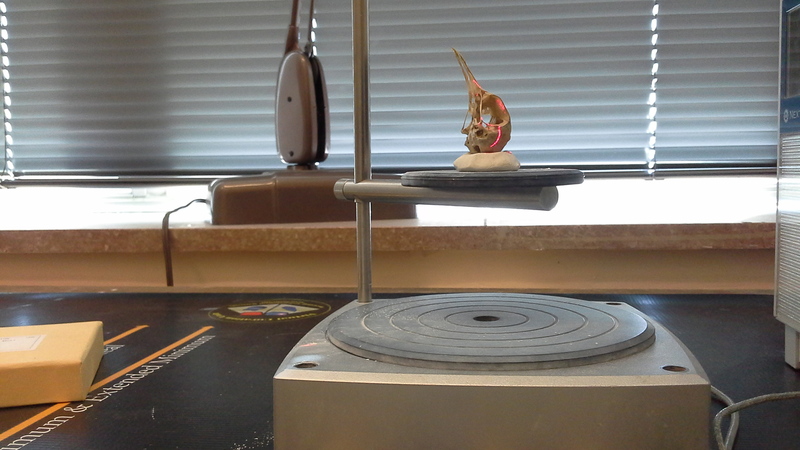 Additional elements will be added to this model as we edit the digital models–the passenger pigeon is particularly challenging for our 3D scanner due to the small size and thinness of the bones. VCL Research Associate Vivian Hite prepares a harelip sucker bone for scanning. We are also working to create digital models of other extinct animals. These include the harelip sucker, an extinct species of fish, provided by Dr. Bruce Manzano of the University of Kentucky, and the Anatolian lion, an extinct species with a scapula provided by Dr. Ben Arbuckle of the University of North Carolina-Chapel Hill. Scapula of an Anatolian lion. In the coming months, we will continue to expand our digital zooarchaeological collections, and work to make the scanned skeletal elements more readily accessible to researchers and students alike. 2013 Virtual Artifact Curation of the Historic Past and the NextEngine Desktop 3D Scanner. Technical Briefs in Historical Archaeology 7:1-12. Peer reviewed article available online at: http://www.sha.org/documents/VirtualArtifacts.pdf. 2014a Zooarchaeology in the 21st Century. Quarterly Bulletin of the Archeological Society of Virginia 69 (1):29-36. 2014b Rocky Raccoon: The Application of 3D Technology to Zooarchaeology. Pennsylvania Archaeologist 84 (1):19-22. 2014c Digital Zooarchaeology: Faunal Analysis in the 21st Century. Unpublished undergraduate honors thesis in Anthropology, School of World Studies, Virginia Commonwealth University, Richmond, Virginia. Great project. How about also scanning some rock doves so zooarchaeologists can use the models to distinguish the two species in post-contact archaeological sites?